NHLView is the roster editor for EA Sports NHL Hockey series on PC. This is by far my biggest and the most important project. The development started in the year 1999 and back then I could not have foreseen that it will be the main editor used by the online community in the future. In 1999, I was just playing around with the roster files and never planned to release anything to the public. And in fact I did not: NHLView 2000 never came out and you will not find it on this web site. However, it was the foundation of the editor I released the following year for NHL 2001. It enjoyed huge success and I decided to continue releasing editors for EA Sports NHL game. Before NHL 2004, all my editors used the same code that I started in 1999, but with the release of the new NHL game the roster format was drastically changed (improved) and the editor had to be totally rewritten. While I was at it, I decided to adopt the unified architecture so that one editor is required for each NHL game. 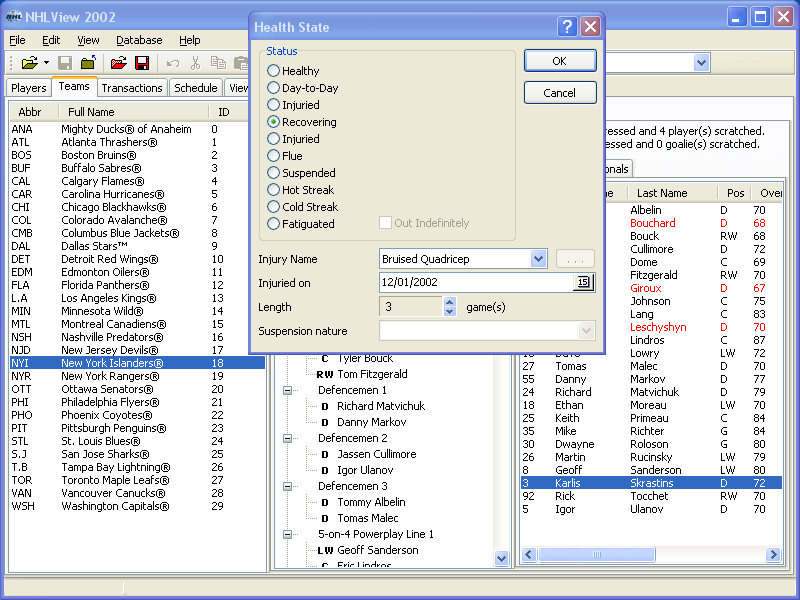 While the work for integrating the support for older NHL games is ongoing, the current version of NHLView is able to deal with NHL 2002, NHL 2004, NHL 2005, NHL 06, NHL 07, NHL 08 and NHL 09 rosters. If you are looking for the editor for more recent console versions of the game, visit the NHLView NG section. 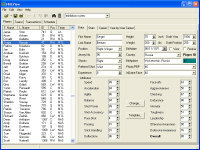 Supports NHL 2002 (view only), NHL 2004, NHL 2005, NHL 06, NHL 07, NHL 08 and NHL 09 rosters. 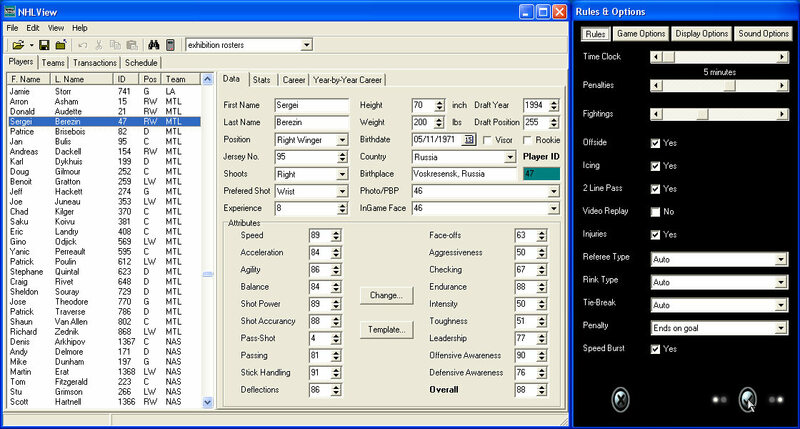 Basic player and team editing: player info, ratings, equipment, team / arena names, arena capacity, play-by-play / art numbers etc. 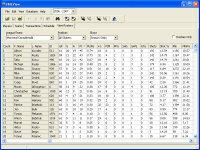 Allows to create / delete players in default, exhibition and season (dynasty, playoffs...) rosters. View team rosters and edit lines. View stats individually for players and in tabular view for the whole team or the league. 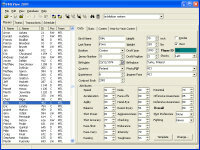 Export tables in popular formats. Season schedule viewer with basic box scores. Viewer of in-game graphics and play-by-play. 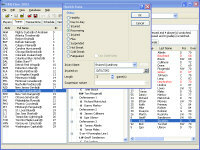 NHLView 5.0.11.25 (last to support Windows 9x) (1.36 MB). 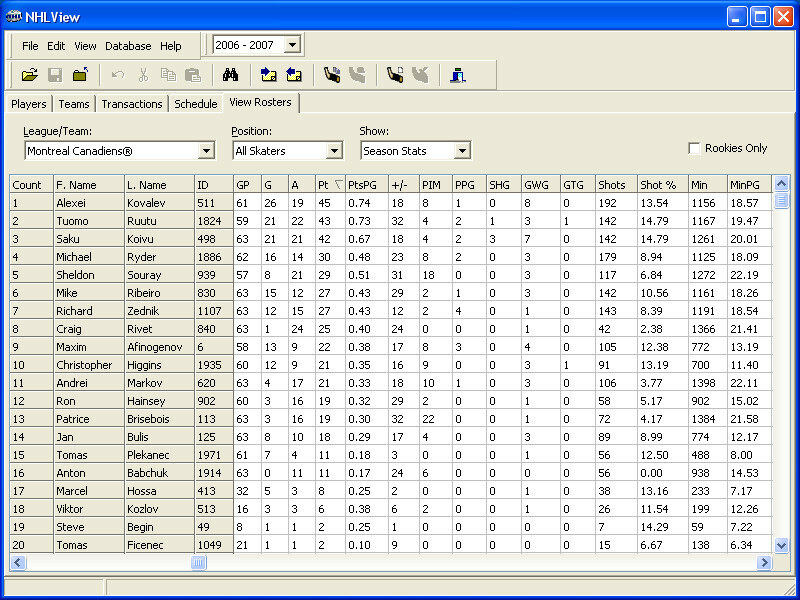 NHLView 2002 1.3.7.20 (1.37 MB). NHLView 2001 0.9.7.16 (1.27 MB).